Nice album booklet featuring artwork of both SNK and Capcom characters as drawn by Capcom artists. Trendy music -- What is it? Rock. Pop. Jazz. Hip-hop. Of course, these are all the general ideas, right? So what about game music? Some games these days in age have the most memorable of beats, as some have the worst composition that you'd sooner roll around in dog feces than listen to. Everyone has that particular game theme that you just can't resist; ranging from NES Zelda BGM to PS Tenma, various game music has made it's mark on the album trade list of today. For now, however, I bring to you the creative defenses of SNK vs. Capcom : Saikyou Fighters! 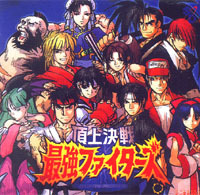 This particular album features the back ground music as found in the NEO GEO Pocket version of the game. Featuring 51 tracks, it seems to be quite entertaining, and for the most part, an "okay sort of album". I don't generally find myself purchasing albums focused around game music, let alone hand-held console game music, but hey. It's Capcom. Gotta love it! The music is indeed unique, and depending on one's taste of versions, this could either be a winner or loser in gamer's mentality. Being a long time player of video games from Capcom, I can say that the character themes are produced quite nicely, falling into a somewhat "midi" file style. As I mentioned above, a startling 51 tracks are featured on this album, with track times ranging from a mere eight seconds, to an extended two minutes and twenty-nine seconds.